Digital PCR (dPCR) enables the detection and characterization of fragmented DNA that is in low abundance in blood. 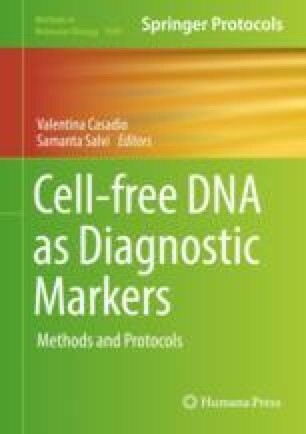 Here, we describe the comparative analysis of mutations in tumor tissue DNA and plasma cell-free DNA (cfDNA) using a dPCR method. Tumor cells are captured by laser microdissection to obtain only cancerous cells from a small quantity of metastatic tissue samples and to exclude inflammatory and stromal cells. We extracted cfDNA from 500 μL of plasma, which is sufficient for target mutation analysis using dPCR. The dPCR assay for the detection of the specific region in the target gene consists of a pair of primers and two probes labeled with a fluorescent dye capable to recognize the presence or absence of a specific mutation. Using the dPCR method, we can identify only a few mutations in tissue that are present also in plasma. This work was supported in part by a grant-in-aid (project number 17K16511) for scientific research from the Ministry of Education, Science and Culture of Japan. The authors wish to thank Dr. Qui Shi, M.D., and Ms. Ikuko Suzu for their excellent technical support.